Summer may be over but don't put away the sunscreen. 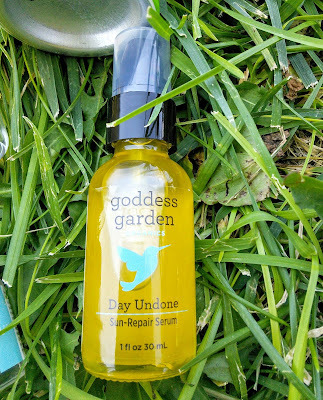 Sponsored Post: I received samples of Garden Goddess Organics to facilitate this post. Most people think that sunscreen is only needed in the summertime. Truth is you need to wear sunscreen year round. If you are like me, there probably have been many occasions that you have not applied the sunscreen when you are out in the sun. For me personally, it has been more times than I would like to admit that my skin was not protected from the harsh rays of the sun. I grew up in a time when nobody really thought about applying sunscreen when swimming, in fact (giving away my age), I remember using baby oil and laying out in the sun to achieve that nice tan. Did you know, 90% of aging is caused by the sun but it can be reversed! Now that I am older and hopefully wiser, I know that sunscreen is important when I go outside in the sun as I don't want to further damage my skin. I also do not want to suffer from sunburn like I did many times as a kid. So I try my hardest to remember to wear my mineral based sunscreen as I don't want chemicals damaging my skin either. I just wish there was a way to undo the damage that I do/did to my skin when I forget/forgot my sunscreen. 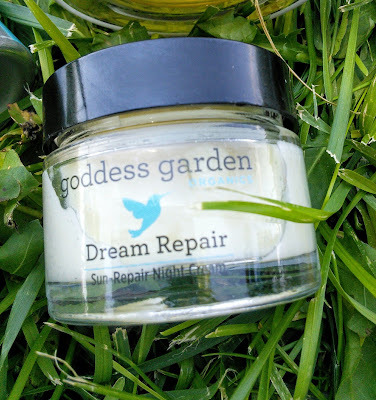 The folks over at Goddess Garden Organics must have had the same wish as they have some wonderful natural products that can help Turn Back Time on my sun damaged skin. My favorite product is After-Sun Gel Spray. This healing aloe vera spray soothes sunburn skin and feels so cool on the skin. I love how easy it is to spray on my skin without mess or stickiness. My teen forgot sunscreen last week when he had a JROTC event. He was in full uniform but the sun still attacked his face. When he got home his face was all red. I told him to spray the After-Sun Gel on his face and by the next day, the redness was gone. Rich in antioxidants and vitamins, Day Undone leaves your skin smooth and soft, with improved texture and elasticity. With a unique blend of natural ingredients like mango extract and licorice root, it instantly softens and smooths your skin, while providing an added lifting effect. Another product that I love using is Day Undone. This natural Sun-Repair Serum quenches my dry skin and makes my skin so soft. I like to apply it at night time along with Goddess Garden Dream Repair to help repair my skin while I sleep. The cream has a nice relaxing lavender scent that smells so good. I am trying to break my habit of using retinol-based products as I was shocked to learn that they have harsh chemicals in them. Knowing that the Dream Repair cream has naturally occurring alpha hydroxy acids in it sure does help with breaking my bad habit of retinol use. Mineral-rich French clay attracts impurities like a magnet while providing necessary nutrients. It leaves your skin soft, clean and nourished, with a tightening effect that minimizes pores and promotes smooth skin. Another product that I have been using from Goddess Garden that makes it easier to wear mineral based sunscreen is Erase The Day. This cleanser cleans away my sunscreen at the end of the day so my skin feels clean and light. I am glad that I have these awesome products to help with my past sunscreen forgetfulness occasions but that does not mean I can go without sunscreen. As always sunscreen is your best friend when going out in the sun along with sunglasses. Wearing sunscreen will help keep those wrinkles away. I am thankful that less skin will be exposed in the fall/ winter so I only have to apply my mineral based sunscreen on my face and neck. 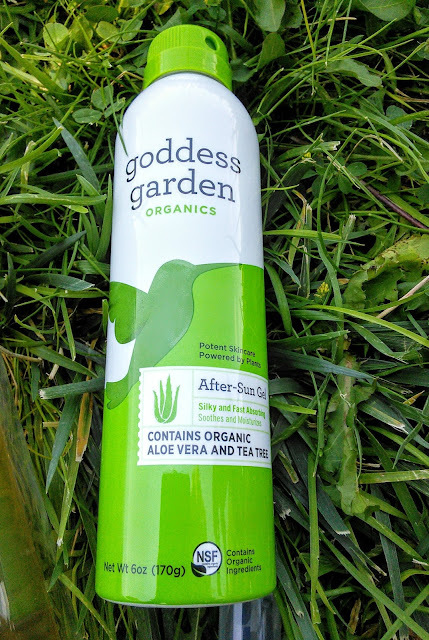 I am pledging to make sunscreen a part of my daily routine along with my new Goddess Garden products. Do you want to turn back time? Now these sound like some amazing products, I would love to start with that dream repair it sounds just perfect. With my super light skin, I am all about sun protection. I had not heard of Goddess Garden products before, but the line looks good! I am a firm believer in using sunscreen every morning! That after sun gel sounds amazing too. I love learning about new products. I will have to check this line out! I haven't heard of this brand before and now I really can't wait to give it a try! I'm all for organic products! I did not know my aging from the sun could be reversed. I'm excited about that and I'm ready to turn back time with these products. Proper skin care is so important and it is not as time consuming as it seems once you get in the routine. Turning back time sounds like a great idea! Lovely products. SUNSCREEN all year long = YES ---- the sun doesn't just GO AWAY in the winter, LOL! And sometimes the worst burns happen thanks to the sun glare off the snow! I love natural products like these, they're so great! Plus, the packaging is just so darn cute! Wearing sunscreen year 'round is so important. I tell people this often! I always wear sunblock year round, especially on my face. But the After-Sun Gel sounds amazing, I would love to have this for the days I still get a little red. Sunscreen lotion both for my face and body is a must-have for me. Am using the Bioré sunscreen coz its good for both face and body in one bottle. Oh I am digging all of these products. But I LOVE the name.... Goddess Garden! So awesome. 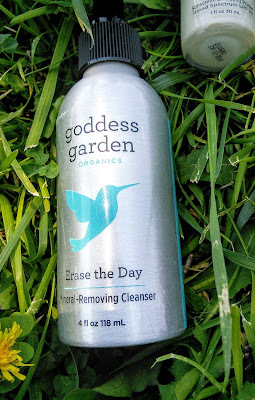 I've used Goddess Garden products before and love them! 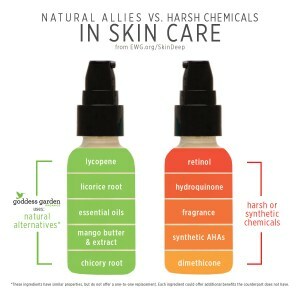 They work so well and I appreciate that their ingredients are naturally sourced and safe! 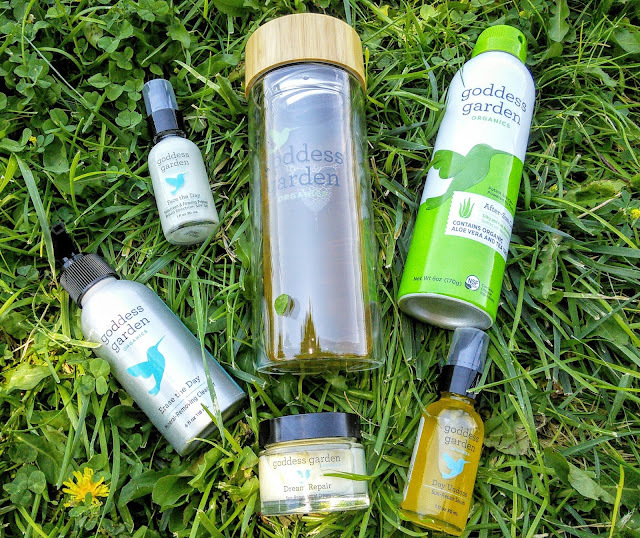 The Goddess Garden Organics products I have never heard of before but they all sounds amazing. Sun is what really can age the skin. Dream Repair I would love to try for sure. Thanks for sharing these awesome products. I need to start incorporating sunscreen into my routine. Seriously!